Drivers in communities throughout the Lower Mainland will experience an increase in road maintenance and construction “Cone Zones” this summer. With repair work on the Pattullo and Burrard bridges, and the Bridgeport overpass, drivers will also have to be aware of, and pay attention to more roadside workers. Today, Vancouver Police (VPD) is partnering with the Work Zone Safety Alliance and WorkSafeBC by increasing traffic offence enforcement to launch “Cone Zone 2016”. Between 2006 and 2015, 14 roadside workers were killed in B.C. and another 226 injured and missed time from work as a result of being hit by motor vehicles while working in a Cone Zone. 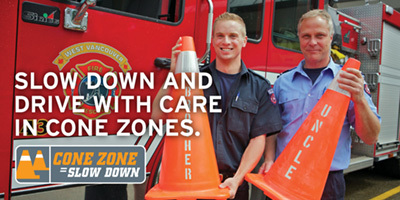 Landscapers, municipal workers, police, fire, paramedics, telecommunication workers, tow-truck drivers, as well as road construction and maintenance workers all use the “Cone Zone” to protect their workplaces. To help prevent collisions, injuries and frustration, drivers should be on the lookout day and night for roadside workers, work zone signage and traffic control devices such as orange cones. To keep themselves and workers safe, drivers need to eliminate any driving distractions, observe the posted speed limit while in the Cone Zone, and follow the directions provided by roadside workers. Planning an alternate route when possible will also help drivers reduce their stress when getting around this summer. Before heading out, drivers should always check local traffic reports, municipal websites or DriveBC for road and highway closures and for information concerning construction and road maintenance activities. In 2015, B.C.’s Motor Vehicle Act Regulation was amended to include maintenance workers, utility workers, land surveyors, animal control workers and garbage collectors under the “Slow Down, Move Over” legislation, which protects the operators of emergency and enforcement vehicles and tow trucks. Drivers should be prepared to reduce speed when driving near a vehicle with flashing amber, red or blue lights. If the posted speed limit is greater than 80 km/h, drivers must slow to 70km/h. If the posted speed is less than 80 km/h, drivers must slow to 40 km/h. In both situations, drivers should be prepared move over and increase the space between their vehicle and the work zone, if it’s safe to do so. “Cone Zones” are there to protect roadside workers and drivers. The ConeZoneBC.com website has tips to help drivers navigate work zones and reduce travel delays caused by roadside work. "In order to help boost safety for roadside workers, we updated the Slow Down, Move Over regulation in 2015 to include and help protect all roadside workers, reducing the risk of them being struck by passing vehicles. We want to remind everyone to be aware of roadside workers during the busy summer construction season, and to drive cautiously and appropriately when passing through a cone zone." The Cone Zone campaign is a joint provincial initiative supported by organizations committed to improving the safety of roadside workers. They are Ambulance Paramedics of BC, Automotive Retailers Association, BCAA, BC Construction Safety Alliance, BC Flagging Association, BC Landscape and Nursery Association, BC Municipal Safety Association, BC Road Builders and Heavy Construction Association, City of Prince George, City of Surrey, IBEW258, Insurance Corporation of BC, Justice Institute of British Columbia, LiUNA Local 1611, Ministry of Transportation and Infrastructure, RCMP, SafetyDriven, SNC-Lavalin Graham Joint Venture (Evergreen Line Rapid Transit Project),Telus, Lower Mainland Police and WorkSafeBC. WorkSafeBC is an independent provincial statutory agency governed by a board of directors that serves about 2.3 million workers and more than 225,000 employers. WorkSafeBC was born from the historic compromise between B.C.’s workers and employers in 1917 where workers gave up the right to sue their employers and fellow workers for injuries on the job in return for a no-fault insurance program fully paid for by employers. WorkSafeBC is committed to safe and healthy workplaces and to providing return-to-work rehabilitation and legislated compensation benefits.